How effective is Echinacea for your Health? Coming from the daisy family, Echinacea is actually a group of flowering plants which is available in nine different species and are commonly referred to as coneflowers. Apart from the flowers of this plant, various parts of this plant are often used as a herbal supplement for curing a variety of disorders – ranging from bronchitis to the common cold. Echinacea contains several essential components such as polysaccharides, betain, glycoside, and caryophylene. Along with these, the plant also has copper, iron, protein, and is rich in vitamins A, C, and E. While buying the supplement, keep in mind that if it is in the form of powdered roots, they could be old and have lost their effectiveness. A good way to check if the herb is fresh is to taste it. If it leaves a tingle on your tongue, you can safely buy it. How does Echinacea Prove to be your Healthy Helpline? Ingesting Echinacea has been found to boost the immune system. Echinacea contains echnacein, a compound that wards off germs and prevents them from entering your healthy cells, so you’re less likely to catch infections. Echinacea also promotes the production of T-Cells (a type of white blood cell) which helps the immune system become stronger. If you’ve got a bad cut or a bruise you don’t want to get infected, Echinacea will not only help in keeping it disinfected, but will also help you to heal faster. This makes it an excellent disinfectant. Most of the times you happen to be at the receiving end when it comes to your body’s battles against virus. Take Echinacea and the supplement will help you recover faster. Signs of sickness such as aches, pains and general weakness will be reduced within a shorter while after its consumptions. Since it is making your system stronger, your illness is less likely to have long-lasting effects. Ear pain, sneezing fits and so on tend to keep coming back, no matter what preventive measures we take. Echinacea helps to reduce these. If taken regularly, the immune boosters present in Echinacea come together in the body and make the overall system stronger, thereby banishing these pesky infections. Some of the components of the Echinacea plant are Natural Killers (NK) which attack cancerous cells our body might produce. The supplement therefore increases the body’s defence against harmful cells, and promotes the growth of beneficial ones. However, reports on this discovery have been inconclusive and are yet to be backed by a strong scientific explanation. For wounds that don’t heal easily and which tend to hurt more, Echinacea helps them to heal and prevents the pain from getting unbearable. The supplement is also used a remedy for haemorrhoids. Studies have found that Echinacea can actually reduce your chances of catching a cold by nearly 60%. With regular use of this supplement, you can combat the red nose and aching head, along with all of the other symptoms of the common cold. Also, if you do happen to catch a cold and take the supplement, your cold heals faster. Your recovery will also be 1.5 days shorter than otherwise. Echinacea is an excellent treatment for constipation and is also known to soothe an irritated stomach. Taking the supplement after a meal will make digestion easier and keep the stomach clean. While this is more of a cosmetic benefit, Echinacea soothes and heals sunburn and is also good for reducing symptoms of sunstroke, such as headaches and dizziness. While Echinacea is seen as widely beneficial, it is not without certain side effect, though these tend to be mild. 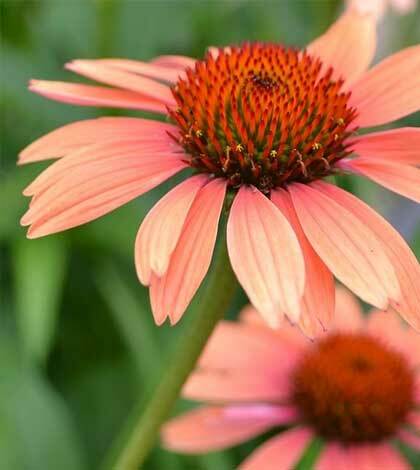 Skin rash, mild abdominal pain and itchy skin are some of the possible side effects Echinacea may have. There are also reports that the supplement, if taken too regularly, may start to suppress the immune system.